Kubi: When did you start working in arts and literature? Dr. Sudha Dhingra: It all started from childhood. I wrote my first poem when I was six. I was a child radio artists. Performed in Dooradharshan, Jalandhar, Punjab and was also involved in live performances on stage. I got gold medal in stage plays. I did my MA and Ph.D in Hindi. Kubi: What inspired you to work for the advancement of Indian languages in the USA? Dr. Sudha Dhingra: I came to St. Louis, Missouri, USA in 1982. There was no temple, cultural, and literary activities. I was worried that our next generation would not have a chance to learn our culture, language and values. I formed an India arts group and started radio program, organized stage plays, and started teaching Hindi language to children in the basement of my house. I also started teaching Hindi at the Washington University, St. Louis. I encouraged people who used to write poetry before coming to USA to pick-up their pen and start writing again. I organized Kavi Goshti's for local poets at my house to provide them a platform for reciting their poems and encourage each other. I encouraged everyone to celebrate their festivals and speak their native language at home so that their children pick-up the language from them. Kubi: When was first kavi sammelan organized? Dr. Sudha Dhingra: I organized my first kavi sammelan in St. Louis in 1984 after joining the International Hindi Association. Hasya kavi Kaka Hathrasi & Virendra Tarun from India were invited and ever since Kavi sammelans have been held every year. Kubi: Tell me about your initial work in the triangle area? Dr. Sudha Dhingra: We moved to the triangle area in 1991. My son was 5 yrs old and we were very happy to find that this area had a vibrant Indian community and a Hindu temple located in Morrisville. I was introduced to Mrs. Sharma and we opened a local chapter of the International Hindi Association. I continued the tradition of organizing Kavi sammelans, started in St. Louis, in the triangle area as well as encouraged local hindi poets to recite poems at get-togethers. I have very good support from Mrs. Saroj Sharma and ever since I moved here, we have organized many temple, Hindi Vikas Mandal, and International Hindi Association programs and events, especially Kavi Sammelans. Kubi: What is the best achievement in life that you felt most happy about? Dr. Sudha Dhingra: When a person comes to me with a personal problem and I see happiness on that person's face after his/her problem is solved gives me most happiness. Spreading happiness and helping needy families is my motto in life. I respect everyone's privacy and do not disclose their information to anyone. Kubi: Tell me more about Vibhutee? Dr. Sudha Dhingra: Vibhutee is the philanthropic arm of Vibhom Enterprises and it helps disadvantaged and distraught women in USA. Usually Indian men like their wives to work like American women and want them to be like an Indian wife at home. Indian women need to prove themselves at work and also be a good Indian wife & mother at home. They go through lot of pressure in US because there is no support system which understands their culture. Sometimes, they cannot keep the balance. I help people to learn and achieve the balance required to lead a fulfilling life. Kubi: What is the work that you are most proud of? Dr. Sudha Dhingra: I enjoy every work I do. I enjoy every moment. I do my work with my heart and dedication. I forget all the bad experiences with people and remember only good things about them. Kubi: What type of books do you write? Dr. Sudha Dhingra: I write poetry and story books. My books focus on nature, culture, women issues and the social challenges they face in everyday life. Dr. Sudha Dhingra: I am involved in many local nonprofit organizations. Some notable examples are: Hindu Society of North Carolina, Hindi Vikas Mandal, International Hindi Association, Heritage Society, Pratham, and Ekal Vidyalya. 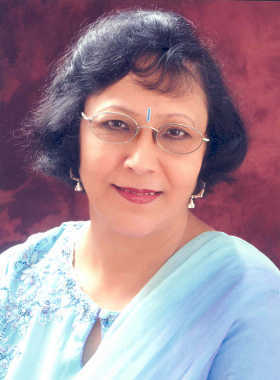 She was board of director for Indian Classical Music & Dance Society (ICMDS). She has helped various organizations (e.g., HSNC, AID, CRY, ASHA, Pratham, EKAL, HVM, and IHA) raise funds through shows and other events. Kubi: Any Departing thoughts you would like to share with us? Comments from Kubi: I was amazed by Dr. Sudha Dhingra's determination to pass the Indian culture & language to the next generation and address the social issues of Indians in U.S. She lives in Morrisville with her husband Dr. Om Dhingra. She can be reached at 919-678-9056. Triangle's own Dr. Sudha Om Dhingra's story book "Kaun Si Zamin Apni" receives 2012 Akhil Bhartiya Ambikaprasad Divya Samriti Prathistha Puruskar" read more..